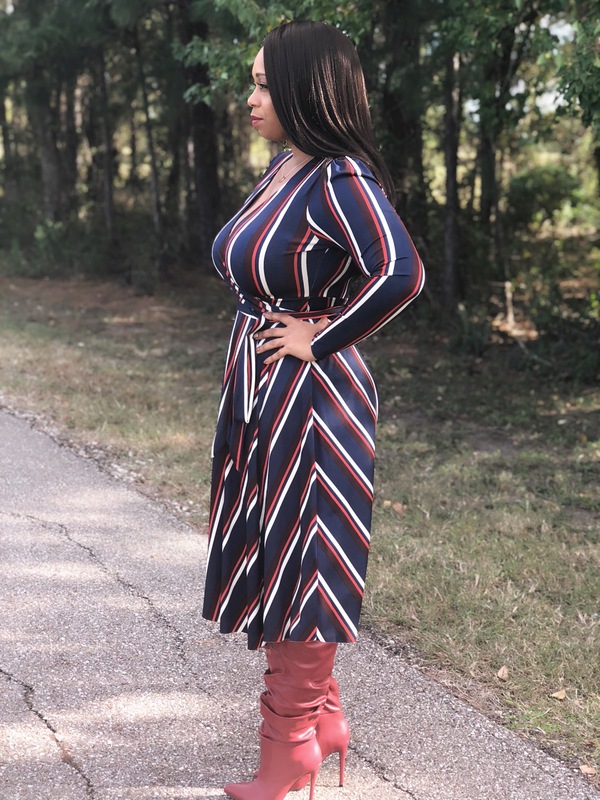 Trending and classic at the same dang time – The Wrap dress! Author rickilovesPosted on October 31, 2017 Categories FashionTags 70s, affordable clothes, affordable fashion, boots, classic wardrobe, dvf, fall trends, Fashion, fashionable, style, styleblogger, wrap dress, zaraLeave a comment on DVF Vibes! You need a denim shirt in your life. Don’t debate me on this lol. For fall and beyond you need two things: A denim or chambray shirt if you’re fancy AND to stop looking back at your past. So first let’s discuss why you need a denim shirt (I’m not fancy). A denim shirt GOES WITH EVERYTHING! I hate to scream but it really does ladies. If you don’t know what to wear throw on a denim shirt and jeans and add accessories or not and you have an instant easy outfit where you looked like you tried (I won’t tell nobody). I have styled my new favorite Levi’s denim shirt which I thrifted for seven dollars 3 ways for 3 different occasions. I love this shirt because it is fitted and can work with a lot of different looks vs an oversized one. First up: Work. If you have a business casual work environment you can throw on a denim shirt with your favorite bottoms for a whole new look. Here I paired my shirt with my Fashion Nova pants which I wore before here. The denim shirt tones down the bold pants and the printed heels add a fun business vibe. The next look I came up with can be worn for happy hours with the girls or date night with your man. I wore one of my fav fun skirts with the shirt this time. It’s a fringe skirt from NY and Co and it’s perfect for going out. The denim shirt pairs well with the neutral color and I tied it at the waist for a sexier feel. I promise even though this skirt is a basic color you could pair your shirt with ANY print or color skirt (even sequins) for a casual glam vibe. The final look is my Mama uniform. I wore my denim shirt with my fav comfortable skinny jeans, new black booties and some fun colorful earrings. I can be chauffeur, cook, assistant, atm OH I mean Mama in this outfit and still feel stylish. 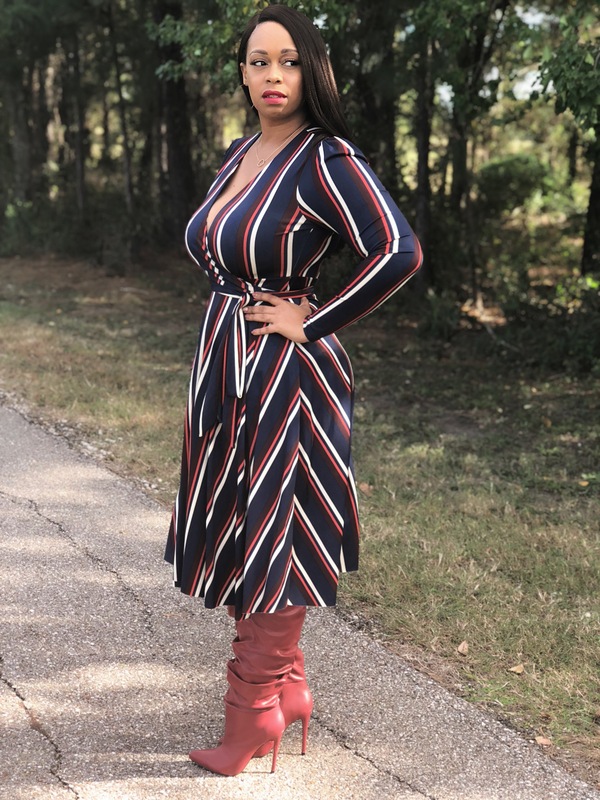 As I thought about writing this post about one of my favorite fall pieces I begin to think about what fall really means. Fall is the time of year people start collecting a harvest from the seeds they planted. I thought about the seeds I’ve planted in my life and ultimately the seeds I wish I planted and I begin going down the dangerous road of my past and what if. What if I would have started this blog in 2009, where would I be now? What if I would have not moved or what if I had made different decisions regarding my life. Would I be where I think I should be? Truth is I will NEVER know and another truth is I have to believe I am on the path that God wants me to be on. I may have not made the best decisions or I may have procrastinated on different things but that doesn’t mean I’m doomed or that I still will not reap a good harvest in my life. So stop looking at the woulda, coulda, shoulda and start making thoughtful decisions NOW because we cannot change our past. We can definitely learn from it but we should not dwell in it and let it make us feel bad or sorry for ourselves. I’m just gonna enjoy where I am now on the way to where I’m going. Hopefully, you’re doing the same. Confession time: I love ratchet music and I am definitely one of the many women I know who are feeling that song! I also like Cardi B. I am not a big fan like my girl Ranisha but I always thought she was pretty genuine and real when I watched her on Love and Hip Hop. I immediately thought about her song when I saw this pants on Fashion Nova’s website. But of course they are more of a mustard than a yellow so I had to change the title of this post to match! LOL Of course I snagged a couple of more items so stay tuned to the blog for more. I had wanted to try the paper bag pants trend for awhile so when they had their 30% off sale a few weeks ago these immediately went into my cart. I love how the pants cinch your waist in! I am not gonna keep ya’ll too long with this post but I missed blogging and I had to share this look! Loving my necklace for only $5! Thanks Eve! So what do ya’ll think about Bodak Yellow? My favorite part is when she says she fixed her teeth and it ain’t cheap! HA! Just a little song to take our minds off all that is happening in the world today. Let me know your thoughts on these pants and the song! Author rickilovesPosted on August 21, 2017 Categories FashionTags affordable fashion, affordable style, casualwear, Fashion, fashion nova, fashion over 30, fashionblogger, lifestyle, pants, style, styleblogger6 Comments on Bodak Mustard? As usual I am late to the graphic tee party. I had been on the look out for a graphic tee I liked ever since I saw this post here. I really wanted to showcase how you can dress a simple tee up or down. You know I am all about stretching your wardrobe and your money. I think I achieved that with these two looks. For the first look I paired my tee with simple jeans and my gold sandals. Let me tell you something about me. I am not a fan of silver on myself. It looks pretty on other people but for me gold tones are usually my preference. It’s all about taking what you love and making it work for you when it comes to style. You don’t have to wear something you may not like simply because it looks good on other people or it’s trendy. I would wear this look anywhere, with the kids doing activities, shopping or even a simple movie date. And because the shirt was only $6 I wouldn’t even feel bad about messing it up lol. For my second look I paired my graphic tee with a pencil skirt and heels. I have to say I was feeling this look. I loved how simple and easy it was to put together but I still felt stylish and chic. The heels added a pop of color as well as my lippie. I would wear this look to happy hour with the girls or a date night out to dinner. When I saw this shirt it also spoke to me lol. My kids say this is my favorite word but it’s funny because I didn’t always know how to say no. I didn’t realize that there was power for me in saying no, and when I said yes to things I didn’t want to do or have I gave up control. How many times have we as women ran ourselves ragged trying to get things done we never really wanted to do in the first place? *Raises hand* I’ve spent my money (don’t co-sign that loan girl! ), my resources and most importantly my time (which you cannot replace) all because I was afraid to say no. I was a people pleaser and I didn’t want someone to not like me because I didn’t want to do what they asked me to. I feared rejection, plain and simple. I had to recognize that it wasn’t my business if people were mad at me because their requests or demands didn’t fit in my agenda. I had to learn if people didn’t want to be my friend or apart of my life because I said no to them then their love or friendship was conditional and I don’t need that anyway. Who wants to always live up to conditions and standards other people place on them and never be able to be human and make mistakes? I realized I had to do what was best for me and learning to say no freed me up for people and activities that benefited my life and guided me toward my purpose. I am not saying don’t do things for people or loved ones but what I am saying is to do those things because you want to and out of love (how many times have we’ve done things we don’t want to and ended up half assing and frustrating ourselves?) Take care of you and regain back your control and time, money, etc. Say no and mean it (be firm but polite and you owe no one any explanations!) And if you still are not sure how to say no, get this t-shirt and just point! Author rickilovesPosted on July 19, 2017 July 19, 2017 Categories FashionTags affordable fashion, affordable style, asos, casualwear, Fashion, fashionblogger, forever21, life lessons, lifestyle, shein, shoedazzle, style, styleblogger, wisdom8 Comments on Just say…Nope! And this jumpsuit is not for me! Happy Friday beautiful people! My family is going thru several transitions this year and one of those changes involves downsizing. To meet a future goal we will be moving into a smaller place temporarily and I honestly am looking forward to it. Less to clean and less expenses and I’m going to enjoy that. I am not however looking forward to a smaller space but I guess you can’t have your cake and eat it too! So I am working on revamping my wardrobe and having less BUT making sure what I have are clothes and shoes I love and make me look and feel great. You will see more of me defining my style and putting together my wardrobe on blog posts to come. Well I can tell you this jumpsuit is not making the cut. I purchased it over a year ago from the BeBe outlet and I did try it on in the store. I loved it when I tried it on but I didn’t think about the fact that I had a bra on AND that this jumpsuit was backless. When I got it home I tried it on again without the bra and with the way I tied the ties in the back I figured I could make it work. BUT I have never worn this jumpsuit! As excited as I was to get it, it has sat in my closet for a whole year. Everytime I was going somewhere where it would be appropriate to wear this, I passed because I didn’t feel comfortable in it overall. It was not made for women with a larger bust (see the darting in the front pics) and even though it was cute overall, I didn’t feel cute in it. It was hard to find the proper undergarments that would hold me to wear it. I could go without but I realize I am an almost 40 year old woman and in my opinion and with the way gravity works it just would not have been a good look for me! So that leads me to say this: we may love something but it may not be the best for us. Apply this where you want: fashion, people, relationships etc. People may even say it looks good (we’ve all heard y’all are so cute together lol)but only you know what is best for you. So this jumpsuit will be given away or sold and I will be on the search for a more versatile summer jumpsuit that looks good on me AND makes me feel good in it. Ladies, do you have things in your life that you love that don’t work for you? I suggest you really evaluate the benefit and joy you actually get from that thing (or person) and decide if you really have room enough to keep it! Make space for the good things! Well I guess that other job isn’t going to work out lol! So I’ll be cute at the one I have for now. 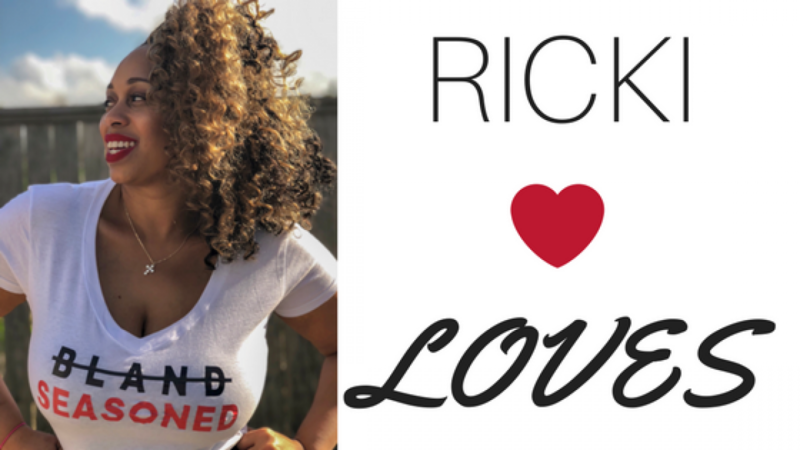 So if you follow me on IG (rickiloves, go follow!) you know I posted yesterday about a possible job change lol. Well the way this body is set up that’s not an option! Also , I can’t dance or shake with any type of coordination so I probably wouldn’t make any money anyway:( I’ll just keep the job I have for now. Even though I don’t love my job I am grateful for employment and to make days better it also helps to be cute and feel good about yourself! 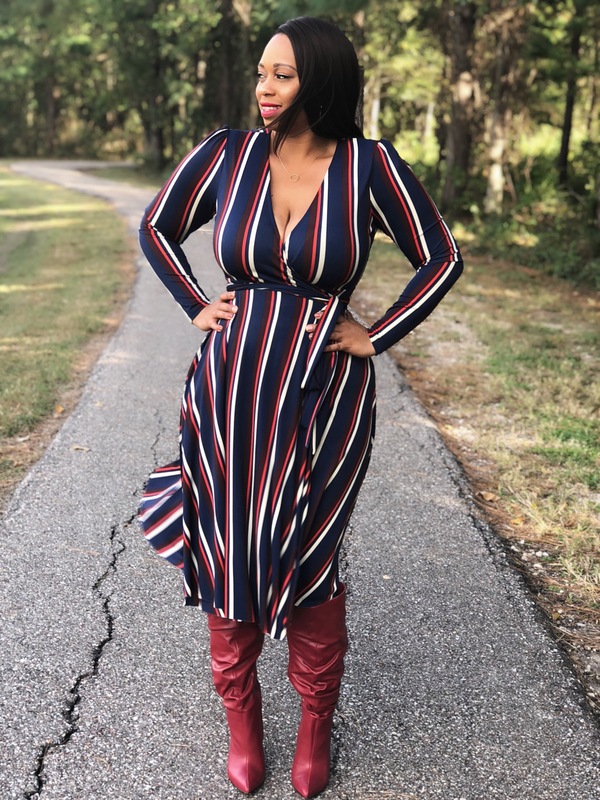 I told yall in my last style post I would stretch my wardrobe and switch up my casual look to a more work appropriate one wearing the same jumpsuit from Forever21. To switch it up I pulled out one of my fav basic wardrobe essentials, a belt! I bought this wide brown leather belt a few years ago from the local Express outlet and I love it! It has elastic and a snap closure so it so it can fit me at just about any size but I especially love what it does whenever I wear it: cinches this waist hunny! Who doesn’t like a small waist? I know I do especially after having 4 children (another reason why I couldn’t take the other job)! The belt also helps you look more put together and professional. Go get you one, I’m definitely on the hunt for more! To help the look be work ready I wore minimal jewelry, put my hair in a bun and added heels. I work in a business casual enviroment but if you have a more professional dress code add a blazer or cardigan. I hope you like this look and it encourages you to think about different ways to wear the same pieces and stretch your clothes and your budget! Let me know in the comments about what pieces you have that can be worn for work and play. 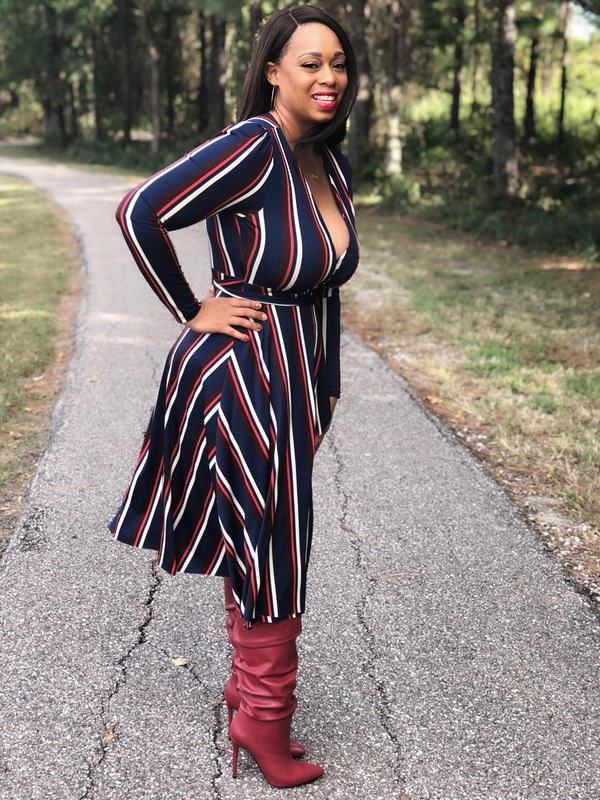 I am a 40 year old woman and mother of 4 who loves sharing about style, beauty and lifestyle topics for the seasoned woman! I want women to know that aging is a privilege and a blessing and life is better when it's seasoned!! !